The landing page is the first page that shows up right after signing in, you can also access this by clicking on “Design” at the top left in the menu bar. Lists of all your recent entities will be displayed here with links to the actual entity grouped by sections and with the date they were created/modified. This menu provides an easy, always accessible entry point to the libraries. 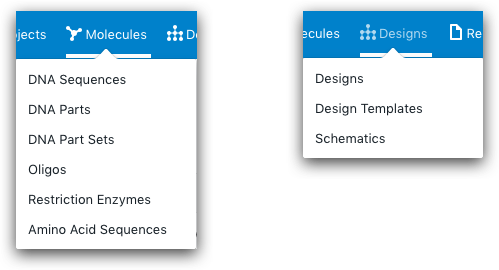 Some of them, like Molecules and Designs, have submenus with more related libraries. Simply click on the name of the library that you want to open. The Task Manager will show you the status of the run while the DNA assembler is working. Double-click on the desired run to open the report once it is completed. If you prefer to work on a dark screen you can select this feature from the top right of the menu bar. You can toggle between dark and light modes at any time. This global search tool will do the searching of the item you are looking for, across all the libraries, by either clicking the magnifying glass icon on the top right of the app or using the keyboard shortcut Cmd (Ctrl on Windows) + Shift + Space.